Adirondack Machine Corporation manufactures FORMAX wet-end laboratory equipment for the pulp and paper industry. The equipment is used by pulp & paper mills, chemical companies, and universities for quality control, R&D, and education. The complete line of wet-end equipment enables the user to prepare stock and form high quality test sheets from virgin and recycled fibers. Frequently, the results obtained using FORMAX equipment in the laboratory, predict performance in full scale commercial operation. The FORMAX brand is recognized throughout the paper industry for quality and reliability. All of our products are warranted for two full years against defects in materials and workmanship. 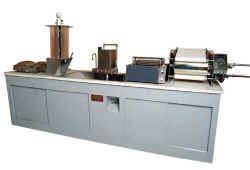 Adirondack Machine Corporation was established in 1963 and has provided high quality laboratory equipment to the paper industry for over 35 years. The main manufacturing building is over 100 years old and was used to manufacture wooden core plugs for over seventy years. As core plugs began to be molded from plastics, the business began to falter and was purchased in 1963. The name was changed from Glens Falls Plug Works to Adirondack Machine Corporation. During the early years of AMC, the company used its wood working knowledge to manufacture museum quality replicas of Revolutionary War Artillery for the National Park Service. Anticipating, that as 1976 approached, the cannon business would also disappear, AMC began manufacturing wet-end laboratory equipment for the pulp and paper industry. The first pulp and paper product manufactured by AMC was a four pound pulper manufactured for the Forestry School in Syracuse New York. Today, we manufacture an entire family of pulpers from 2 ounce to 300 pound capacity. During the late 1970s and early 1980s, our product offering expanded to meet the changing needs of the pulp and paper industry. Current products include Hot Plates, Sheet Dryers, Sheet Molds, Flotation De-inking Cells, Roll Presses, Screw Presses and Automatic Sheet Forming Machines.